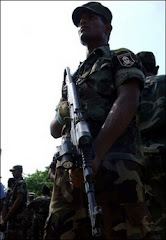 The ongoing military campaign in the East, centered on LTTE-held areas in the Batticaloa district, has given the military a clear edge over the enemy. The two-and-half month long campaign involves Special Forces, Commandos and the infantry. The ground action is backed by the air force. "We have inflicted sizeable losses on the enemy. They are on the run," a senior military official said on Sunday. Referring to bomb attacks on two private buses over the weekend, he said that this could be a sign of desperation. "They are trying to offset battlefield losses by triggering chaos in the South." Speaking on the condition of anonymity, he detailed a series of successful operations in the Batticaloa theatre, where the army overcame initial setbacks to gradually increase pressure, thereby facilitating forays into the Vanni cadres’ heartland. "What we are doing is unconventional. In fact, we haven’t tried this sort of a thing on this scale before. The bottom line is that we are hitting them at their doorstep"
Quoting from intelligence reports and enemy broadcasts, the official said that over 500 LTTE cadres perished in action. He placed the number of senior cadres killed at seven with the last being a former commander of Charles Anthony ‘Brigade’ considered an elite fighting formation. The former commander is believed to have succumbed to his injuries suffered in a recent artillery attack. The seven leaders are believed to have held the rank of Lieutenant Colonel. The military said that a large number of middle level leaders too had been killed in confrontations. The army had lost 35 personnel. Chief of Defence Staff Air Chief Marshal Donald Perera and Army Chief Lt. Gen. Sarath Fonseka recently visited the 23 Brigade Headquarters at Welikanda for a first hand briefing. The Vanni leadership’s failure to replenish units fighting in the East has triggered desertions. Since the launch of the ongoing campaign about two and half months ago, over 80 cadres had surrendered. "They painted a picture of despair in areas under their control," the official said. Almost all of them had not received a decent meal for some time, he said. "We provided them with a good meal with plenty of vegetables," he said. "They are a beaten lot." The military expects more desertions as supplies plummet due to military action. The army has committed sizeable resources for the offensive. The military said that the collapse of the enemy’s eastern bases would have a devastating impact on the units based in the Vanni.